Oh dear! I can't remember what these buildings are....but you must admit, the architecture is great! A cathedral in the main streets of Edinburgh - it's soooooooo medieval! Royal Yatch Britannia - once used by Queen Elizabeth and her family for vacations and voyages. The famed Rosslyn Chapel - thanks to "Da Vinci Code"
Arthur's seat - great aerial view of the whole city from up here. Curry Leaf serves almost all types of Indian food imaginable: from banana leaf rice to nasi briyani; roti canai, thosai to naan bread; tandoori chicken to varuval mutton; different different types of vegetarian dishes; your regular teh tarik or teh halia to a refreshing lassi drink that comes in assorted flavours! Below: Mango lassi priced at RM3.50 per glass. One of my all time favourite is their fried squid - perfectly deep fried in red flour batter, sprinkled with sesame seeds, with a squeeze of lime, topped with ringed onions and of course, curry leaves! It is very crispy with a slight sweet, spicy and sour lime juice flavour which makes this a perfect dish for anything you are eating especially rice. Another notable dish is their fried chicken. Bursting with flavours, crispy batter on the outside and tender meat on the inside! Tell me......who doesn't like fried stuff?? LOL! At RM5.00, you get to enjoy their banana leaf rice. Comes with 8 vegetarian side dishes (yes guys, you read that right....8 side dishes!) - pumpkin, varuval potatoes, brinjals, long beans, sambal tofu, cabbage, bittergourd just to name a few; papadams; a choice of hot fish, chicken or dhall curry, this is one heck of an economy rice! Taste wise, it is definitely your above average type of banana leaf set! Just nice for the Chinese palate and tastebuds. Their naan bread also deserves some limelight too. I've ordered a garlic naan here. Naan is a healthier version of bread as it is baked in a terracota clay oven and not fried - ideal for weight watchers. Haha.... It is non-oily, topped with a generous amount of chopped garlics and and has a strong buttery taste that can still be tasted even if you dip it in your choice of curries! I totally enjoyed this - very much! Stressful? Yes...but in the same time, it enlightens you many things in many ways! It helps you build rapport in a peculiar method.... it shows you bits of life in a theatrical point of view....it shows you the various emotions and characters of human being..... Finally, it teaches a man to BE a human being! 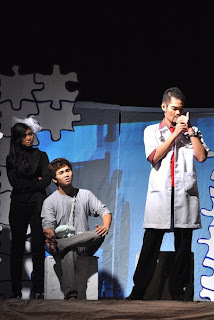 If you like the limelight, being an actor is like a dream come true! No one gets better attention than being on stage under a spotlight! If you act well then it's great! But if you fumble....you'll look like a fool! Next year will be my clinical years....I'll have to spend more time with patients and probably be facing much stress from this (according to seniors)....so, one less stress would be nice! If you know what I mean? I don't know-lah............decisions are mere decisions......it varies from time to time..... For now, I'll say I had enough......but trully in my heart, acting is never satisfactory for me! 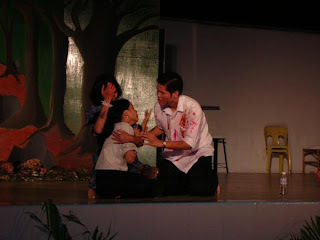 Last year, March 2009, I put myself into my residential college's Malay theatre competition. 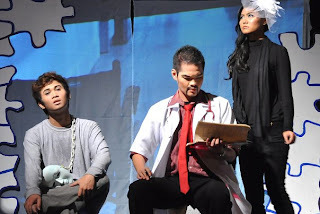 The title of the play, Kan Ku Bunuh Cinta. 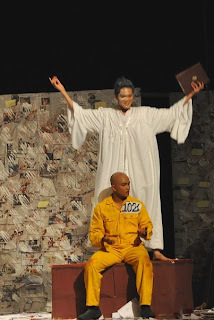 My role as Akal. We won FIRST place! Look's like my dream car (for now) - Toyota Prius Hybrid is the most sold car in Japan! Man.....no wonder people say great minds think alike. This proves one thing: (Most) Japanese and I have good taste! LOL! TOKYO (AP): The Toyota Prius was the top-selling car in Japan last year - the first time a gas-electric hybrid has clinched that spot. The Japan Automobile Dealers Association said Friday that Toyota Motor Corp.'s Prius was No. 1 in its ranking of sales by vehicle models - with 208,876 Prius cars sold in 2009, nearly three times the numbers sold the previous year. Coming in second was Honda Motor Co.'s Fit, followed by the Toyota Vitz. Both aren't hybrids but are small and fuel efficient models. Green models have gotten a huge lift this year in Japan from a government cash-for-clunkers program and tax breaks, aimed at boosting sales during a global slowdown that has seriously hurt Japanese automakers. The Prius was the top-selling model for every month from May last year - the month when an upgraded version hit showrooms. It is so popular buyers must wait weeks to get their Prius. Demand for the Prius has also been strong in the U.S.
Japan's auto market has been stagnant for decades, and the perk from hybrid sales is a bright spot amid overall dismal demand. Auto sales in Japan declined to their lowest level in 38 years last year, slumping 9 percent to 2.9 million vehicles, and falling below 3 million units for the first time since 1971, according to the association earlier this week. Japanese automakers are looking to emerging markets such as China, India and Southeast Asia to keep demand going as prospects for growth are also weak in the U.S. and Europe.